Dorm Co. Tip: Keep dorm desk supplies, cosmetics, and other dorm essentials organized in your dorm closet! Don't know where to keep your college supplies? When you're in a small college dorm room, it can be tough. Small desk dorm items and dorm accessories can be hard to store because there's not many designated dorm room storage areas. When you don't have designated dorm room storage areas for those small dorm items, they can frequently end up in a messy pile somewhere in your dorm closet or on your dorm desk and end up detracting from dorm room decor. Plus that mess of small college supplies will stress you out a little bit. Don't think it won't stress you out? Picture trying to sort through that pile for a pen or sticky notes for your college courses! Stay organized and add to dorm room decor from the start with our Over The Door Hanging Dorm Organizer! Our Over The Door Hanging Dorm Organizer comes in a Maui Blue Aqua color for the pockets and has a neutral birch backdrop so you can add some bright color to your dorm room decor. There are four pockets in this dorm organizer so you can hold college supplies like sticky notes, pens, highlighters, or even your cosmetics! Plus you will have an option of where you can place this dorm organizer. It has dorm hangers that will work on all dorm doors or college closet rods. 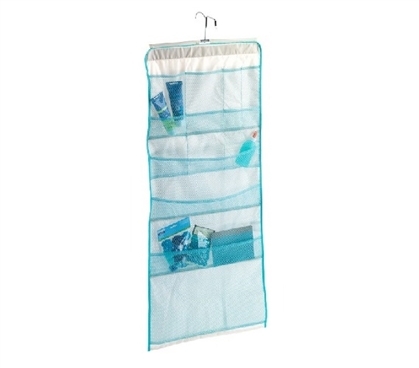 So if you want to keep this dorm organizer out within arm's reach on your dorm door you can, or if you would rather hide it away in your college closet, you can do that also! With the multipurpose function of this dorm essential, you will be able to change up how you use it throughout your college life!